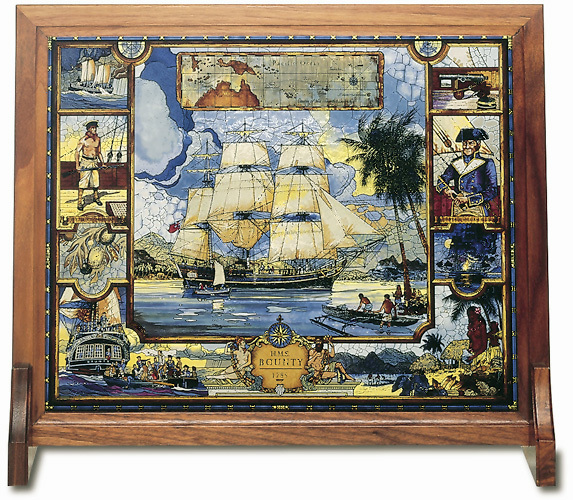 This is the only stained glass art of the Bounty in the world, created by the artisans of Glassmasters, the only artists who have been authorized to reproduce the work of Louis Comfort Tiffany. The tableau is signed by designer Jack Woodson, certifying for all time its authenticity. The tableau is framed in hand-rubbed walnut. The dramatic beauty of this stained glass art changes at various times of the day, and with different sources of light.